If World War 1 impacted Australia in terms of sheer numbers of losses, it was largely remote from Australia. Just 20 years after the Treaty of Versailles bought the Great War to an end, World War 2 (WW 2) began, initially in Europe. But this conflict was to bring the war to Australia’s doorstep; bombs rained on its Northernmost settlements and the threat of invasion seemed real and imminent. It changed Australia’s outlook on the world and our society forever. WW 2 commenced when Britain and the Commonwealth declared war on Germany following its invasion of Poland in September 1939. As in World War 1, Britain's former colonies rallied to her colours. Australia, which had run down its defence forces dramatically during the 1930s, immediately set about raising the Second Australian Imperial Force (AIF) to comprise the 6th, 7th, 8th and 9th Divisions for overseas service. With the conflict initially confined to Europe, the first units of the AIF were despatched to the United Kingdom, which by then was standing alone against the might of Nazi occupied Europe with an imminent prospect of invasion, a depleted Army with much of its equipment lost after the retreat from Dunkirk and just its Air Force and Navy standing between a beleaguered island and a Nazi invasion force. The Australian Second AIF 6th, 7th and 9th Divisions were despatched as in the Great War, to the Middle East. The 8th Division was moved to Malaya to join British garrison forces there. At the time it was a move that seemed relatively benign but one which was later to have far reaching consequences. In June 1941 the Soviet Union entered the War when it was invaded by Germany. This at last diverted a major slice of the German war machine away from other theatres of battle in which Britain and its Dominion Forces were barely holding on. The Middle East campaign may have seemed much like WW1 to the Australian population, when the War was a very long way away. Australian Forces fought with distinction throughout the Middle East campaign, operations in Libya in North Africa where they largely expelled the Italian Forces there, before the campaign fragmented with forays to Greece, Crete and Syria. The latter was successful in overcomning the Vichy French forces there but Greece/Crete ended in disaster as the Germans came to aid of their beleagured Ally, Italy. Later with the arrival of the German Afrika Corps in the Western Desert, the Siege of Tobruk based on the defence of this key port earning the AIF a new chapter in the annals of military history. Meanwhile Australia had committed naval elements to the Mediterranean early in the war. Ships such as the HMAS Sydney, which played a key role in an action at Cape Spada off Crete resulting in the sinking of the Italian crusier Bartoleomo Corleoni and later in the Battle of Taranto. The legendary "Scrap Iron Flotilla", HMAS Stuart, Voyager, Vampire, Vendetta and Waterhen were made famous at the Battle of Matapan and the so-called "Tobruk Ferry Service" in which 'Waterhen' was lost. The RAAF provided a major commitment to the UK through the Empire Air Training Scheme, with thousands of men training and ultimately serving alongside and within the Royal Air Force in the United Kingdom. Indeed it was among these men, primarily those in Bomber Command, where a large proportion of Australia's losses in WW 2 occurred. 10th Squadron RAAF had been in the UK at the outbreak of war to take delivery of its Sunderland Flying Boats. It was to remain in the UK as part of Coastal Command for the duration of the War. RAAF units also served in the Middle East as part of the 'Desert Air Force' and later in the Italian campaign in the northern Mediterranean. Australia's focus changed dramatically on 7 December 1941 when the Japanese entered the War by bombing Pearl Harbour, and crippling the US Pacific Fleet. This action brought the USA into the War as well. All of a sudden, Australia was in direct imminent danger. The 8th Division, fully 25% of the AIF's Field Force, was swallowed up by the Japanese advance down the Malay Peninsula. Britain's "Fortress Singapore" strategy went down with its two capital ships HMS Prince of Wales and HMS Repulse, sunk off the Malayan coast by Japanese air power without any worthwhile air support of their own. Australia's naval and air units also took a mauling with the loss of HMAS Yarra and HMAS Perth, and numerous fighter light bomber and maritime patrol aircraft. With the fall of Singapore in February 1942, the 8th Division was largely consigned to captivity for the rest of the War. The 6th and 7th Divisions were hastily recalled from the Middle East. A major divide occurred between the Curtin Government in Australia and Britain's Sir Winston Churchill, when Churchill tried to re-direct the convoy to Burma to support beleaguered British and Indian forces there. Curtin was having none of that and it is hard to imagine the troops on board wanting to be anywhere other than rushing to the defence of their own homeland. This precipitated the famous speech in which Curtin said that Australia now turned to the United States as its principal partner in stemming the Japanese threat, thus radically re-shaping Australia's traditional strategic relationships. The shock loss of Singapore and nearly all of the 8th Division to the seemingly unstoppable Japanese onslaught caused near panic in Australia. To further deepen the sense of foreboding, a scratch force, called "Blackfoprce" after its commander South Australian Brigadier Arthur Blackburn, VC, had been diverted to Java from the returning convoy, and was effectively abandoned in a hopeless situation. Despite the conduct of an effective delaying defence, it too was swallowed up thus squandering a significant capability that would be sorely needed elsewhere. Other elements of the 8th Division scattered through the islands of Timor and New Britain suffered a similar fate; "Gull Force" at Rabaul and "Lark Force" in Ambon were overwhelmed and subjected to brutal atrocities by the Japanese victors. Only "Sparrow Force" in Timor avoided total annihilation and went on to wage a guerilla war against the Japanese for some time. Back in Australia, all that was left in the way of armed forces was the Militia or Citizen's Forces. The militia battalions, many with direct lineage to the battalions of the First World War, were also mobilised on the outbreak of war, but for home service (and in designated territories) only. This created a schism with the AIF that had far reaching consequences well beyond the Second World War. The militia were derisively referred to as 'Chocko's' by the AIF, implying that they were 'chocolate soldiers' who would 'melt' when 'the heat was on'. Ironically, 'the heat was on' very shortly afterwards. Darwin was bombed for the first time in February 1942, with heavy loss of life and not entirely creiditable behaviour by some of the forces deployed there. Fortuitously, the Battle of the Coral Sea in May 1942 checked the Japanese advance and their intention to put a marine landing force ashore near Port Moresby. It was the first naval battle in which the ships engaged in it never sighted one another, but rather fought it out with naval air power. However their goal to mount an amphibious landing in the south of Papua, thwarted by the losses at Coral Sea, was replaced with an overland strategy. Things got worse for the Australians when the Japanese landed on the north coast of New Guinea in June 1942. This very soon developed into the Kokada campaign by August 1942. 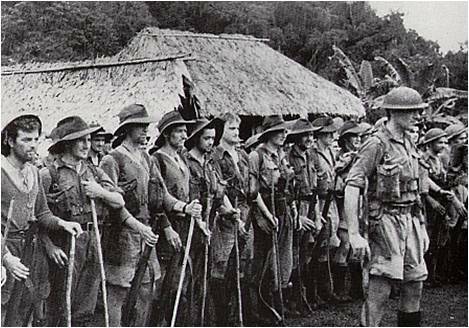 It was a Militia Battalion the 39th, which stoically stood in the breach against a Japanese force that threatened Port Moresby. This was achieved despite being seriously outnumbered; under equipped with no artillery or support weapons; poorly supplied with inadequate food and clothing; being directed by a dysfunctional higher command structure in a combined US / Australian headquarters in Brisbane that had no first hand notion of the conditions under which operations were being conducted. In the author's opinion, a greater scandal in the conduct of the nation's defence cannot be found. Chockos indeed. They held the line in appalling conditions until relieved by the newly arrived 7th Division, including the South Australian 2nd/27th Battalion, who themselves were placed under severe pressure in stemming the Japanese tide. Concurrently, elements of the 6th Division including South Australia's 2nd /10th Battalion and supported by the RAAF, inflicted the first defeat of the War on Japanese land forces at the Battle of Milne Bay on the Eastern tip of Papua New Guinea in August - September 1942 as famously noted by Field Marshal Sir William Slim commander of the British 14th Army in Burma. Meanwhile Australia's remaining Division still in the Middle East, the 9th Division, played a key role in the final defeat of the Germans at El Alamein in late 1942. The 9th Division then also returned to Australia.